This week I am excited to introduce to you the second of our 3 Marys….Mary Heller! Mary Heller is a mother, a NICU Nurse Anesthetist, famous water gardener, and a needle fiber artist. Mary was all of 8 years old when Mrs.Doylen taught her 4H group how to knit. Her first project was a pair of slipper bootees knit with yellow worsted wool. Latch rugs were favorite projects but her interest in the fiber arts waned until she was in college where she met a sorority sister who enjoyed knitting. So she started dabbling in the needle arts again. While living in Ann Arbor attending nursing school, Mary found a needlepoint store close to campus and she found that stitching was a great outlet from studying and it was an affordable way for her to make gifts for her friends and family. She tells me that wool was the only fiber available for stitching until the metallics were introduced and then the WOW factor was introduced to her needlepoint world. Mary also enjoyed sewing in the past. She remembers Faber’s was a favorite fabric store back in the 70’s. Mary has two sons (now 21 & 24 years of age), married to a doctor, and has always had a career in the medical world – busy lady! Then about 15 years ago, Mary was stricken with Whooping Cough and found solace in her knitting needles. She started knitting afghans while she was in recovery and hasn’t stopped knitting since. Five nieces and nephews have received afghans in their college colors upon high school graduation. She’s always knitting a baby garment for someone special in her life and she is wildly creative & prolific in her sweater knitting. Mary loves life & it is evident in her knitting & yarn selections. 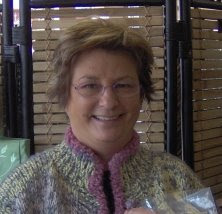 She uses color to accent designs – loves Colinette & Prism yarns. I remember shopping with Mary at the first Stitches convention in Saint Paul several years ago – we both fell in love with Maggie Jackson’s couture designs! She tells me she has an entire room dedicated to storing her knitting & needlepoint stash…a girl after my heart! >Hi Cis..Just an FYI…an ANESTHESIOLOGIST is a medical doctor who specializes in, and takes a residency in anesthesia.A nurse who has extra training in anesthesia is called a NURSE ANESTHETIST.I would suspect that Mary is a nurse anesthetist, unless she went to medical school in addition to nursing school.